Written by 75 authorities from the fields of climate change, epidemiology, environmental health, environmental engineering, global health, medicine, medical anthropology, nutrition, population, and public health. 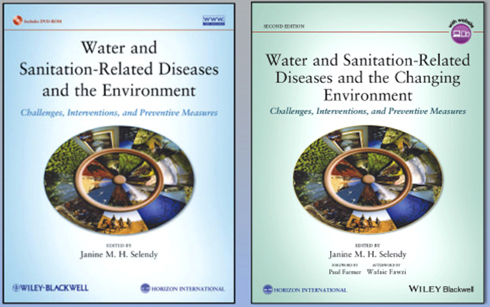 The new volume Water and Sanitation-Related Diseases and the Changing Environment: Challenges, Interventions, and Preventive Measures is, as was the First Edition, a Wiley-Blackwell publication in collaboration with Horizon International compiled and edited by Janine M. H. Selendy. Recognizing the consequences of climate change now evident and that need to be anticipated in order to minimize foreseeable and unforeseen consequences, climate change is factored into the 2ndEdition’s updated and revised chapters and in new chapters. “These books emphasize the linkages between water and sanitation with a range of infectious diseases, food systems and malnutrition, and water pollutants. Throughout the text, we see how each of these elements interrelates with climate change, extreme weather, and ecosystem changes. Climate change is already impacting food and water systems globally, threatening our ability to provide safe and adequate food and water for the world’s growing and urbanizing population. Agricultural production systems are under increased pressure to feed a hungry planet that is also suffering from water pollution and other forms of environmental degradation. Agricultural Burning: FIGURE 4.5 Agricultural burning in about 4 million square kilometers throughout central Africa. Fires burning in the southern region of the Democratic Republic of the Congo, Zambia and Angola. Actively burning areas outlined in red. Photo from the NASA’s Aqua satellite June 3, 2016. NASA, NOAA, and the U.S. Department of Defense. https://www.nasa.gov/image-feature/goddard/2016/fires-in-angola-zambia-d.... From Chapter 4: “Water, Food and the Environment,” by Robert Wyman and Guigui Yao. 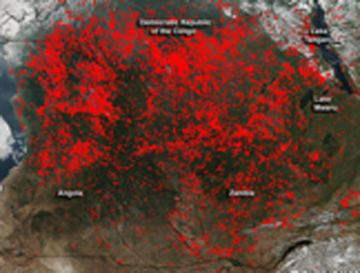 Agricultural burning in about 4 million square kilometers throughout central Africa. Fires burning in the southern region of the Democratic Republic of the Congo, Zambia and Angola. Actively burning areas outlined in red. Photo from the NASA’s Aqua satellite June 3, 2016. NASA, NOAA, and the U.S. Department of Defense. https://www.nasa.gov/image-feature/goddard/2016/fires-in-angola-zambia-democratic-republic-of-the-congo. In Chapter 4, “Water, Food and the Environment,” by Robert Wyman and Guigui Yao. "The intertwined nature of human health, water, food, and natural ecosystems is not to be overlooked. The framers and signatories to the Sustainable Development Goals understood this dynamic: 'Access to safe water and sanitation and sound management of freshwater ecosystems are essential to human health and to environmental sustainability and economic prosperity.' Progress in one area—hunger, sustainable communities, climate action—have implications for others—water and sanitation, health and wellbeing, poverty, and inequality. “Donald Hopkins and Ernesto Ruiz-Tiben describe the effort to eradicate guinea worm, and how this ambitious task has gone from possible to probable to imminent. The success stories in this book demonstrate that, often, we know what works. And when we fail, the scientific, civic, and activists communities are capable of coming together to overcome obstacles. "The human right to water and sanitation also serves to align various stakeholder groups. Commitment from world leaders must be matched by that from national and local decision-makers, donors and funding agencies, and researchers and program implementers alike. Protection of ecosystems and prevention of pollutants involves collaboration among leaders and participants at global, national and local levels. In several chapters of these books, the authors have reminded us of “the necessity of community engagement as a requisite for success. · Offers an understanding of the interconnection among many water-related diseases, sanitation, and hygiene (WASH) factors. · Provides an appreciation of the concerns and most recent solutions addressed from an international perspective. · Provides strategies for securing safe water, sanitation, and hygiene. · Is filled with compelling examples of successful interventions and how they were accomplished, such as the near eradication of Guinea worm disease. 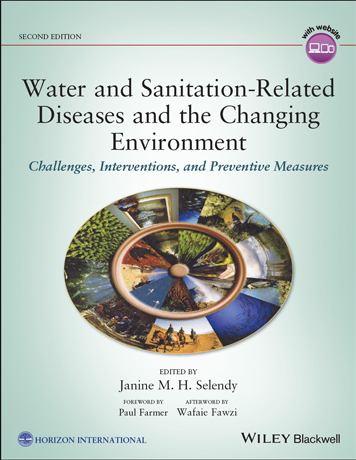 Written for students and professionals in public health and medicine, chemical and environmental engineering, and international affairs, and for decision-makers and corporate leaders, this new edition of Water and Sanitation-Related Diseases and the Changing Environment is a comprehensive resource that complements the first edition.